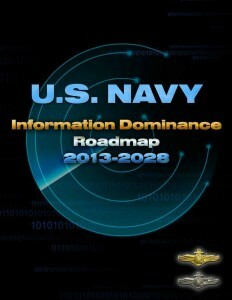 The U.S. Navy just released it’s Information Dominance Roadmap 2013-2028. This document serves as the Information Dominance Corps (IDC) strategy document into the future. Looking for additional IDC and Navy Strategy documents check out Navy Cyber Power 2020 which supports the Navy Strategy for Achieving Information Dominance, additional related supporting documents include: the Navy Information Dominance Roadmap, 2013-2028; the Navy IDC Human Capital Strategy, 2012-2017; the Naval Intelligence Strategy, 2013-2020; and, the 2013 Navy Space Strategy. Within this integrated framework, the Navy begins in earnest the process of marshaling its resources, galvanizing the workforce, and aligning Navy’s Information Dominance capabilities to fully enable the Navy’s primary tenet of Warfighting First.